Recently I came across some of those crazy purple potatoes I've been reading all about. As an impulse buy, of course I bought them. (I am, after all, a retailers dream in that way.) They taste like normal potatoes except, well, they're an amazing shade of purple/blue. That's one way to dress up your typical potato salad! And speaking of potato salads, is there more controversy over the proper way to make any other dish (a rhetorical question, clearly, since such things so easily become controversies)? In a collection of her essays called Home Cooking, Laurie Colwin maintains that "there is no such thing as really bad potato salad... 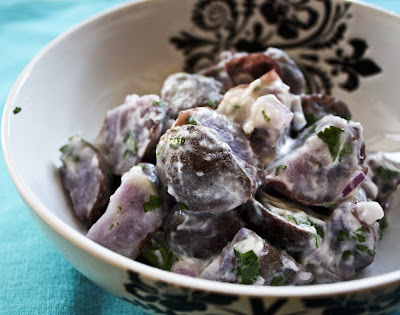 Some potato salads are sublime, some are miraculous and some are merely ordinary." Colwin goes into quite an explanation of the proper potato to use. Although "close to all purpose" the "new potato does not absorb dressing the way an Idaho or russet does." For my first potato salad, however, I was going with blue. 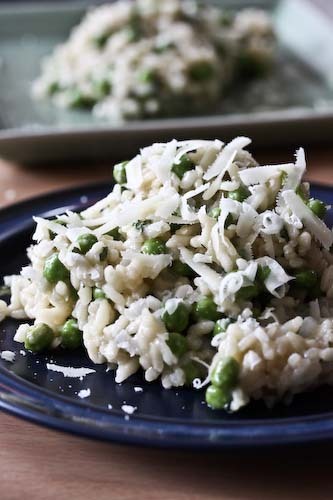 Colwin provides recipes where potatoes are dressed in a vinaigrette of Dijon mustard, one in which they are kissed with crème fraîche, and she describes her mother's as including chopped celery and catsup in the dressing to produce a kind of pink potato salad. In my 1975 edition of Joy of Cooking, it is recommended that potato salad be made from potatoes cooked in their skin, then peeled and marinated while still warm. This is the principle on which the recipe I finally settled is based. It's from the L.L. Bean Book of New New England Cookery and it is excellent. Just the right tang:cream ratio. Boil the potatoes with their skins on in lightly salted water under fork tender. Drain, skin and cut them into bite-sized chunks. Pour the warm chicken broth over them, toss with the scallions/onion and the herbs and let sit for 15 minutes. Drizzle with the oil and vinegar, season with the salt and pepper and fold in the mayonnaise. Brilliant. UPDATE: I should admit that I didn't use anywhere near 3 pounds of potatoes for just the two of us. As a result, I eye-balled the rest of the ingredients, just adding what I felt like, and I have a feeling I added much less mayonnaise in comparison to the other ingredients. But I kept the vinegar and oil the same! Potatoes are one of my favorite foods-looking forward to trying this recipe. Keep asking if she has tried the veal! I want it:)! hi Andrea! i've never tried purple potatoes before, i'm sure i need to try it sooner or later. the color is gorgeous! Hello Andrea. I love the New England Potato Salad. I'll need to tell my sister-in-law about your site. She lives in Mystic, CT. To be honest with you, I have never seen purple potatoes, maybe I'm just not looking, but I will. Could you please go to my chocolate blog: http://chocolateloreandmore.blogspot.com/ . I have something for you. 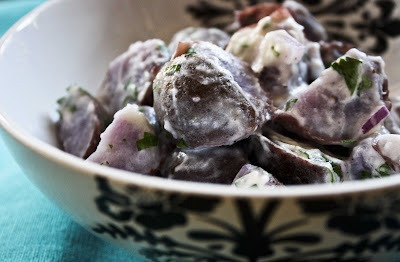 Purple potatoes are fantastic, and this salad looks like a winner!